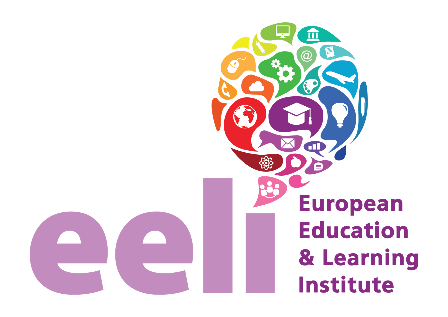 Welcome to the first newsletter of our Erasmus+ project Intercultural Training for Educators (InterTrainE). 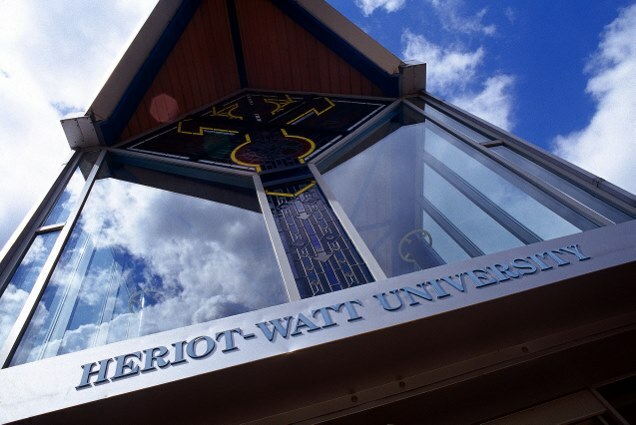 The 27-month project (2018-2020) is led by Heriot-Watt University and the Coordinator is Dr Katerina Strani from the Department of Languages and Intercultural Studies. 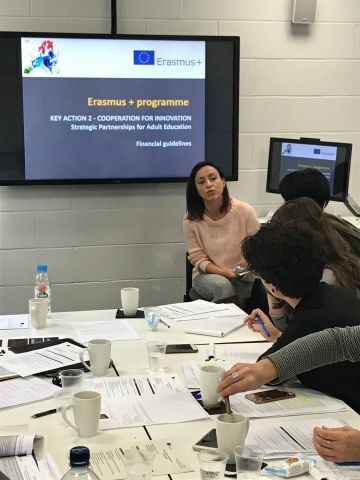 InterTrainE includes 7 partners from 4 countries (UK, Finland, Italy and Greece) and aims to develop an intercultural training programme for educators teaching adult migrants. Specifically, the project will develop a modularised training curriculum with qualification standards specialised for Adult Education. It will also produce a handbook for trainers including a theoretical framework of basic concepts, learning outcomes and the training package itself which will include practical exercises and, where possible, case studies. All the training materials will be uploaded to a MOOC. 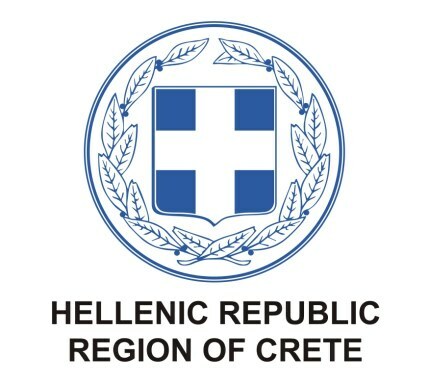 A Joint Staff Training Event will take place in Rethymnon, Crete, in March 2020, where the partners will test the curriculum and training materials before these are finalised and presented at the Final Dissemination Conference in Edinburgh in September 2020. 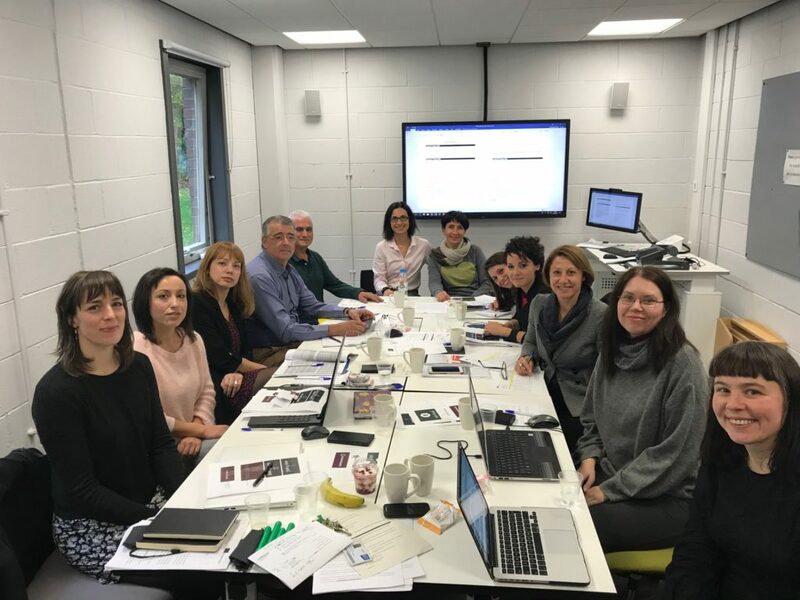 Our kick-off meeting took place in Edinburgh on 22-23 October 2018. 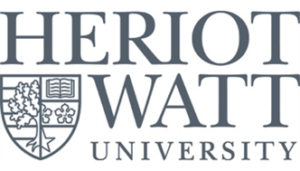 Partners met at Heriot-Watt University‘s Riccarton campus and discussed the project’s timeline, milestones and deadlines. They agreed on the project logo and on the design of the website. Each partner gave an overview of the Intellectual Output that they would be leading. The project evaluation procedures were also finalised, and the procedure of appointing an external evaluator was agreed upon. The external evaluator for the project will be Dr Jim Crowther, Senior Lecturer in Community Education, University of Edinburgh. The full agenda of the meeting can be found here. The first two Intellectual Outputs (IO1 and IO2) constitute a needs analysis. For IO1, Online questionnaires on educators’ and learners’ experiences and views on intercultural education in each country were designed and distributed. A database of stakeholders in every partner country was created for this purpose as well as for general dissemination purposes. The questionnaire data was collected, analysed and evaluated by each partner. National reports were drafted accordingly, and a project report was completed by CLP, who led this output, in December 2018. The project report for IO1, which includes the questionnaire templates and findings from all countries participating in the project, can be found here. semi-structured interviews of experts and educators in adult education in each partner country. Interviews are currently under way and the findings will be compared to existing data on qualifications and competences available. 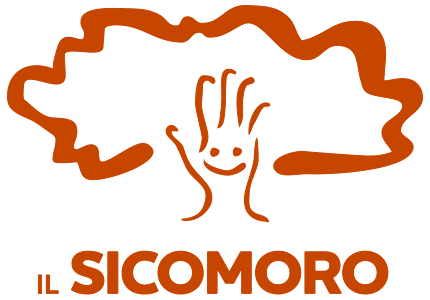 National reports will be drafted, and the leading partner for this IO, Il Sicomoro, will compile the project report for IO2. This is estimated to be ready in March – watch this space! Our project website and social media accounts will soon be available, so stay tuned! LINCS is not only about languages; it stands for Languages and INterCultural Studies and our core purpose is to create multilingual, multicultural, global citizens. To achieve this, the “INCS” in LINCS specialises in (inter)cultural studies such as living cultural heritage, language policy and intercultural communication. Our Cultural Studies section manages the cultural studies courses and programmes we deliver. Courses include Global Heritage, Cross-Cultural perspectives on Society, Intercultural perspectives on Sustainable Development, as well as the Global Courses (taught in all HWU campuses) Intercultural Issues in Business and Management (Undergraduate), and Intercultural Communication in the Workplace (Postgraduate). It also manages our MSc Cultural Heritages programme family, which includes our MSc in Tourism and Heritage Management. Cultural Studies staff and students are also members of our Intercultural Research Centre (IRC). Katerina Strani is the Head of the Cultural Studies section. She has a background in Languages and Political Theory and her PhD thesis (2011) focused on communicative rationality in the public sphere. 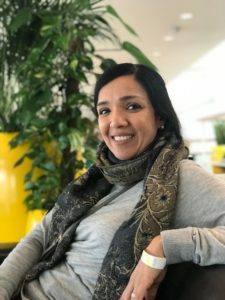 Her research is interdisciplinary and she is interested in how multilingualism and multiculturalism shape contemporary society and politics at all levels. 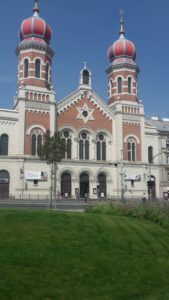 Following an EU-funded project on hate speech and racism (RADAR), Katerina has developed a keen research interest in the concept of race, particularly race relations and the language of race. She teaches International Politics, Society and Institutions in Contemporary Europe, Intercultural Issues in Business and Management and Conference Interpreting. For a list of publications, please click here; for a list of funded projects, please click here. Máiréad Nic Craith is Professor of European Culture and Heritage and she previously held a Chair in the School of Social Sciences and Applied Social Studies at the University of Ulster, as well as honorary professorships in other institutions in the UK and abroad. 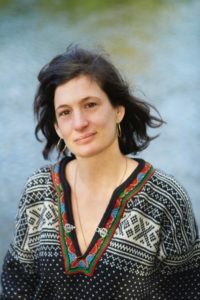 She has received many accolades for her publications, including the Ruth Michaelis-Jena Ratcliff research prize for folklife (joint winner), which was awarded at the University of Edinburgh in 2004. In 2009 she was elected to the Royal Irish Academy. Máiréad has served on numerous research evaluation panels in Europe, Canada and Australia. In 2011, she was invited by the United Nations as an expert on access to heritage as a human right. In 2013, she was invited by the European Centre on Minority Issues as an expert on (linguistic) minorities. Ullrich Kockel is Professor of Cultural Ecology and Sustainability at HWU, as well as Emeritus Professor of Ethnology at the University of Ulster and Visiting Professor in Vytautas Magnus University, Kaunas. 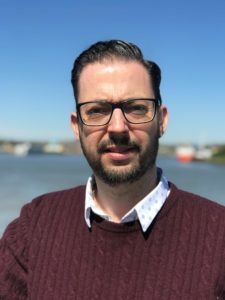 He has a diverse academic and professional background, switching from a career in industrial management (Shell) to academic positions in Economics, Political Science, Sociology, and later Irish Studies and Ethnology. In 2003 he was elected to the Academy of Social Sciences and in 2012 he was elected to the Royal Irish Academy. Kerstin Pfeiffer is the Director of Undergraduate Teaching Programmes in LINCS and is a member of several committees at School and University level. She also represents the School of Social Sciences on Subject Panel B (Design, Visual Arts, Architecture, Creative Writing, Film, Drama & Theatre Studies, Cultural Policy (Policy, Arts Management & Creative Industries), Music, Television Studies) of the Scottish Graduate School for the Arts and Humanities. She teaches courses in German language, history and culture at UG and PG level. Kerstin’s research interests lie in the area of theatre and performance studies and particularly in the investigation of the afterlives of older dramatic forms and the role of drama in shaping, maintaining and challenging notions of identity and community. She has published on these topics and presented her research at many international conferences. Thesis topic: Living Tradition and Cultural Revival: Scottish Folk Drama in the 21st Century, supervised by Kerstin Pfeiffer, Gary West, Neill Martin and Donald Smith. Jos’s research project results from a partnership between the IRC, Celtic and Scottish Studies (University of Edinburgh) and Traditional Arts and Culture Scotland (TRACS, Scottish Storytelling Centre). It examines the reasons behind the resurgence of interest in this old art form and folk custom and its cultural implications. It seeks to investigate the motivations for participants and what these can tell us about modern attitudes to concepts like tradition and authenticity. The main aim of the project is to explore the place of revived folk drama in contemporary Scottish society through the following objectives: to produce a survey of Scottish folk drama activities today; to examine community-led performances and related activities ethnographically; to evaluate the motivations and aspirations of participants and organisers and to assess their contribution to aspects of local identity, ideas of tradition, and community dynamics; to investigate how folk drama as a living practice contributes to developing conceptualisations of Intangible Cultural Heritage in Scotland; and to contribute to the newly emerging ‘Creative Ethnology’ movement led by the three institutions involved. 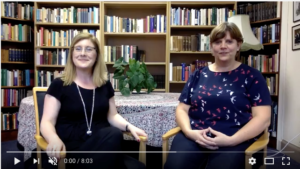 Thesis topic: Collecting and preserving access to Intangible Cultural Heritage within the digital environment: Evaluating New Models for Scotland, supervised by Máiréad Nic Craith and Ullrich Kockel. Co-supervision from heritage specialists is provided by Alistair Bell, Sound Curator, National Library of Scotland and Scotland’s Sounds Project Manager, and Dr Hugh Hagan, National Records of Scotland, whose expertise includes oral history and community heritage. Thesis topic: ‘Becoming a smaller part of a larger whole: changing perceptions of European identity in the Scottish independence movement’, supervised by Katerina Strani and Ullrich Kockel. Thesis topic: ‘Curating Heritage for Sustainable Communities in Highly Vulnerable Environments: The Case of Scotland’s Northern Isles’, supervised by Ullrich Kockel, Donna Heddle and Ian Tait. As one of the longest relationship in the history, the Auld Alliance challenges the recent Brexit discourse, which seeks to establish a new geography outside of Europe. In its pursuit of a separatist utopia free from bonds of European policy, Brexit offers a fictionalised geography that denies Scotland’s seven centuries of European cultural belonging. 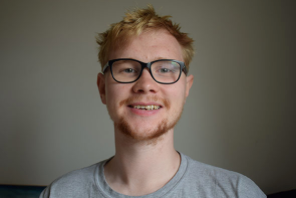 Marc’s PhD research is an exploration of the Auld Alliance as a re-reading of Scotland’s heritage discourse with a view to establishing a counter-heritage (to that which lies in the wings post-Brexit), one that establishes an identity that cannot readily disentangle itself from European culture. In a country where almost 20% of its population are in fact from foreign origin and in which 5% of the total population came from European Union, such political discourse endangers its multicultural stability. Perhaps it is reflection of why Scotland voted to remain at 63%. This research is intrigued by work of cultural discourse scholars, including Foucault, Said and Bakhtin, whose theory of cultural consumption space provides with the conceptual vocabularies such as ‘orientalism’ and the ‘third space’. These spaces are unusual, anti-structured and exceptional. Framed within such notions, the material and imaginary landscape of Istanbul Bazaar offers such venue for cultural consumption experience in non-Western context. The primary aim of this study is to bring together contemporary cultural discourse in a traditional marketplace, with particular focus on the Istanbul Bazaar, testing the usefulness of such theory as an interpretive framework in a specific exceptional space in non-Western context. More specifically, this study aims to offer insight into an understanding of Western consumers’ journey and experience, examining the dynamic process that flows from pre-visit to post-visit. The mixed-method approach is used to collect data from both visitors and locals in order to answer the aim of this study. The qualitative approach is applied using observation, netnography and interviews, while the quantitative approach is applied using questionnaires. For a list of Ozge’s publications, please click here. We are very pleased to announce that our EU-funded Moving Languages project has now come to an end! 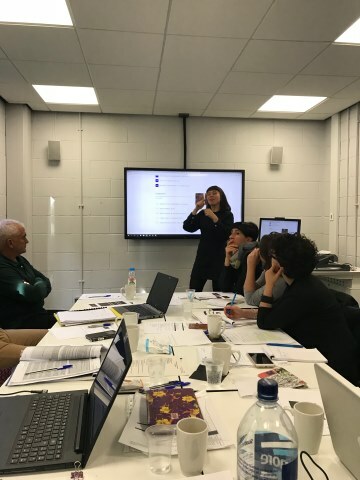 The 27-month project (2016-2018), led by Learnmera Oy in Finland with LINCS at Heriot-Watt as a partner, developed a free mobile application designed to help new migrants learn the host language(s) and familiarise themselves with culture-specific vocabulary and concepts. A user-friendly, versatile and comprehensive app, it also aims to encourage people to learn other languages and promote understanding between cultures. The Moving Languages app provides a gamified language- and culture-learning tool. It contains 4000+ illustrated vocabulary items for easy concept recognition, grammar exercises, flashcards, reading comprehension, listening comprehension, culture, administration, health and immigration tabs, dialogues with audio, audio spelling and comprehension tests and many other features. The app covers topics that are essential during the first steps of living in the host country. They can also use the main languages as support languages if they wishes. This means that if you download the English app, you can learn English from 25 languages in total. We launched the app at an event held in June 2018 and held our final meeting in Bilbao on 4th October 2018 to finalise the app and the project. It has been a pleasure to work with our international partners in this project and to engage with users who have tried our app. The project may have ended, but our apps will be available for free for the next 3 years, so please download them, try them, and send us your feedback! To download the Spanish, German, Italian, Finnish and Swedish language apps, please click here. Not for the first time, the Eurovision Song Contest has managed to draw attention to language issues in a revealing way. We all know the controversies over the years about countries choosing to sing in English. If you thought that wasn’t happening so much nowadays, the 2017 final featured 42 songs, of which 35 were sung entirely in English – at 83%, that’s the highest proportion ever. 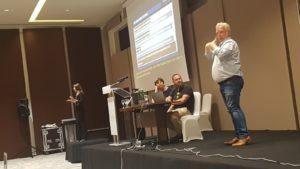 You may be less aware, though, that Eurovision has also offered its own unique window on the place of sign language in society. Back in 2005, the Latvian entry ‘The War Is Not Over’ featured a final chorus in which the performers, Valters & Kaža, left their stools and laid down their acoustic guitars to sign alongside their signing. It’s not clear why. The song received the famous douze points from Ireland, Lithuania and Moldova, and finished 5th overall. Things nearly got more interesting in 2009 when a Deaf artist, Signmark, competed in Finland’s national Eurovision qualifications. Signmark (real name: Marko Vuoriheimo), who was born into a signing family, performed ‘Speakerbox’ with a hearing singer. But the song ended up in second place in the Finnish competition and so narrowly missed out on being chosen for the grand Eurovision final. Nevertheless, Signmark went on to great things and goes down in history as the first deaf person to sign a recording contract with an international record company (Warner Music). And what’s the story in 2018? This year, the UK has decided to experiment with signing. SuRie, our representative in Lisbon, has recorded a British Sign Language version of her track ‘Storm’. The BBC proudly reported that she learnt it “in just a few hours”. SuRie has, we’re told, “been wanting to learn BSL for a long time” and jumped at the chance to pursue this when a fan sent her a video of himself signing ‘Storm’. The BBC’s Newsround said: “She got in touch and asked if he would teach her how to sign the lyrics too”. 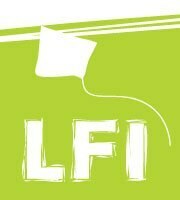 The initiative soon started to attract interest. A clip was released on Twitter, but not everyone was enthusiastic, with one person even saying “this makes me want to poke my eyes out”. The singer anxiously replied “I realise there’s tons more to BSL than I was able to portray here and that I have a helluva lot more to learn”. More discussion followed, spinning out – that’s social media, folks! – into strongly-worded antagonism and much taking of sides. So what’s going on here? And why is this a LifeinLINCS issue? Well, as a department, LINCS teaches both spoken and signed languages. And we specialise in both translation and interpreting studies, and intercultural research. The SuRie ‘Storm’-in-a-teacup touches on every part of this. British Sign Language (BSL) wasn’t even understood to be a language until the mid-1970s. Ten years later, it started to be taught in earnest. And within 20 years of that point, it had become one of the most popular adult education subjects in the UK. 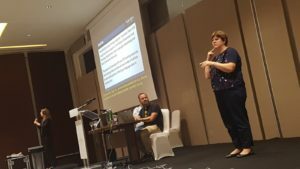 Almost all of that teaching was being led by Deaf BSL users. Now, thanks in part to a Heriot-Watt initiative, plans are afoot to offer BSL as a full language subject in schools across Scotland. 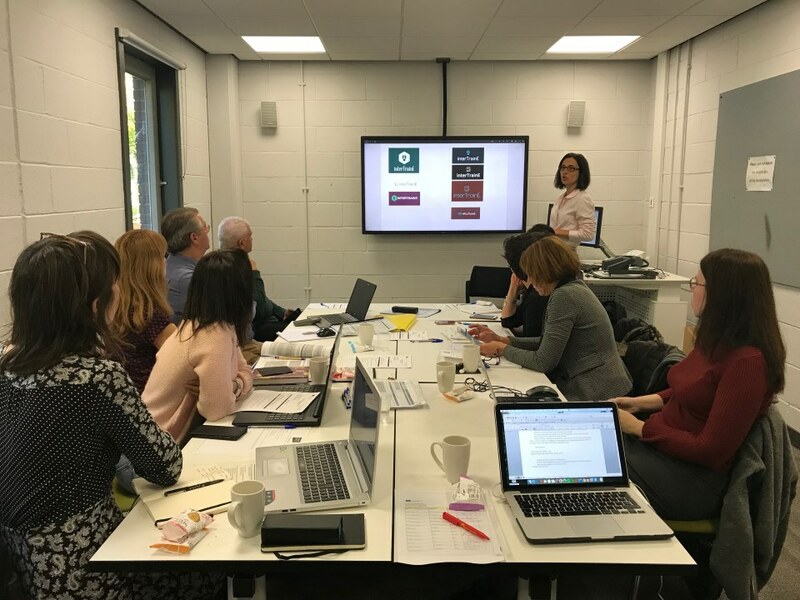 LINCS’ own Dr Ella Leith is currently on secondment to the Scottish Qualifications Authority, coordinating a project to develop BSL qualifications for high schools. Exciting times! But this starts to show why SuRie’s BSL work has frustrated some. BSL simply can’t be learned meaningfully in two hours: “It’s a complex language, you know” noted one tweeter, “way beyond swear words and song lyrics and Trump’s sign name”. The professionalisation of BSL teaching has been pursued for over 30 years. 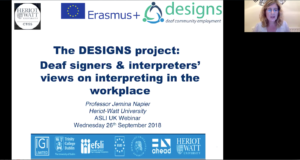 Reversing the historic oppression of the language has been wrapped up with highlighting, as teachers, Deaf people for whom BSL is a preferred language. Then there’s the question of the quality of the BSL translation. 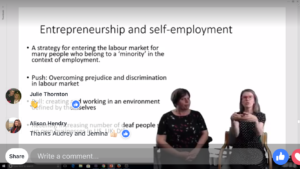 LINCS students work their socks off not for hours but for years (eg on our main undergraduate programme to develop the ability to produce effective BSL output from English source material. And they wouldn’t start with artistic matter like song lyrics, either! Above all, perhaps, an opportunity has been missed to do some valuable intercultural work. A Eurovision entry that had been seriously planned with both sung and signed content, developed by artists with profound knowledge of the underlying issues of language and heritage, would have been much less likely to have been viewed as ‘cultural appropriation’ at work. Can there be a happy ending to this story? Eurovision reached over 180 million television viewers in 2017. 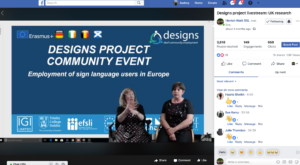 Sending any kind of message to such an audience about effective engagement with sign language and with considered, high-quality translation would have to be welcome. 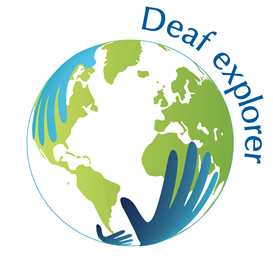 The big prize, though, would be to show clearly that Deaf people aren’t so much “in need” of some crumbs of “access” from the hearing world’s table, but are contributors to society with extraordinary artistic, linguistic and cultural riches to share. LINCS’ own work on the intangible heritage of the Deaf community reinforces that there are many creative artists using BSL. The Scottish Government’s National Plan for BSL envisages “promotion” of BSL as part of the shared cultural life of the nation. We’re working to get that message out through initiatives like the current two-year Royal Society of Edinburgh project to construct a Deaf Heritage network which can feed BSL inspiration into national cultural institutions. SuRie appears to have quickly realised that there was more to all of this than meets the eye, saying: “Probs best if I leave it to the professionals, I really never intended to disappoint anyone in the community… but I realise I’m out of my depth and I do apologise”. Perhaps the very best thing she could do would be to turn this outcome on its head by coming out as a true champion for BSL in society and the arts. Now that really would send a clear signal. 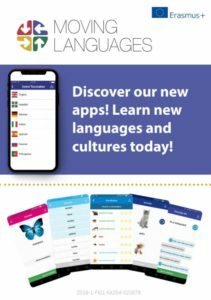 Moving Languages – English application launch ! The Moving Languages application constitutes an EU-funded project designed to help new migrants learn the host language(s) and familiarise themselves with culture-specific vocabulary. A user-friendly, versatile and comprehensive app, it also aims to encourage people to learn other languages and promote understanding between cultures. Our mission is to help combat linguistic and cultural isolation, which is proven to be one of the key barriers to the successful integration of migrants. The project is led by Finnish organisation Learnmera Oy. This free application provides a gamified language and culture-learning solution. It contains 4000+ illustrated vocabulary items for easy concept recognition. It will be available for download from all major app stores from June 2018. Users can learn English, Spanish, Italian, German, Swedish, Finnish (main languages) from 20 support languages, widely spoken by refugees/migrants in the partner countries: Albanian, Arabic, Bulgarian, Chinese, Croatian, Estonian, French, Hungarian, Kurdish (Sorani), Polish, Portuguese, Punjabi, Romanian, Russian, Serbian, Somali, Tigrinya, Turkish, Ukrainian, Urdu. Are you a user of any of the main or support languages? Do you work in the languages or intercultural communication industry? Then join us at the launch of the English version of the Moving Languages application! The event will be followed by a feedback session and a drinks reception for an opportunity to find out more about the project. Details on how to get to the venue will be emailed to registered participants. “Wie, Sie … äh… du weißt nicht wie Snapchat geht?” Three pairs of eyes fix me in complete disbelief. A part of me wants the floor of the rehearsal room to open wide and swallow me there and then. For the third time in less than two hours I am pleading age-related ignorance of this or that social media platform. And it is only day 1 of the workshop. 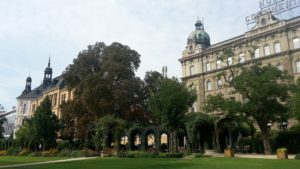 Catching up with 21st-century culture was an interesting by-product of my work with Čojč Theaternetzwerk Böhmen Bayern (http://cojc.eu/cs/), a Czech-German theatre network in 2017. The network organises bilingual theatre projects on both sides of the border, and I joined last year’s main project, Like/Hate, as a participant observer. For two weeks in August and September, Like/Hate brought together 20 young people aged 14 to 27 living Bavaria and Bohemia to create a theatrical performance centering on the influence of social networks on our thinking, behaviour, and the way we present ourselves to the world. 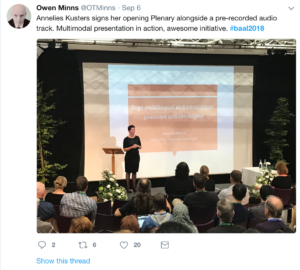 My main reason for observing the project had less to do with the question how we conceive of performing the self in and through social media than with an interest in the participants’ real-life communication and interactions – with each other and with the audience. 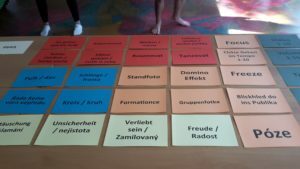 In many bilingual youth projects along the German borders, pooling linguistic resources is considered one of the main strategies for facilitating intercultural dialogue and fostering cross-border relationships unencumbered (or at least less encumbered) by the baggage of historical differences between the Germans and their neighbours. 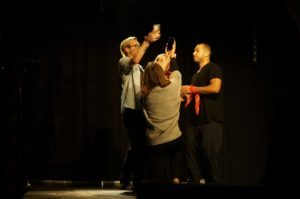 Čojč projects are no exception but they go one step further in that they aim to create performances which are accessible to monolingual speakers of Czech and German alike by using a hybrid of Czech and German, Čojč, on stage. The network motto provides a good example of how this can work: ‘Mit divadlem theater hýbat grenzen hranicemi bewegen’. The word Čojč itself is a blend of from the Czech word for the Czech language, Česky, and the use of Czech spelling for the word [d]eutsch – [d]ojč, and in some senses, Čojč (the language) is the verbal manifestation of a strong sense of a distinct regional identity grounded in the historical and cultural particularities of the Bavarian-Bohemian border region that pervades the network. So how does the Čojč network use language(s) to express, negotiate and potentially transform (individual) identities? How do workshop participants communicate with each other? Which language do they use, when, and why? What are the effects of using a hybrid language on the audience? In other words, how is regional identity performed and how is it changed in and through performance? And how do such performances integrate into contemporary discourses about the role of regions in responding to societal challenges within the EU? These were just some the questions that guided my observation of the devising process and the interviews I conducted with participants and network members. 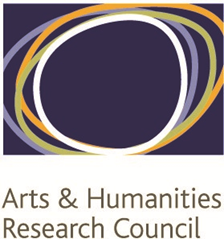 The larger framework for this research is the Horizon2020-funded project Critical Heritages: performing and representing identities in Europe (CoHERE) (https://research.ncl.ac.uk/cohere/) which investigates the socio-political and cultural significance of European heritages and their role in developing communitarian identities. 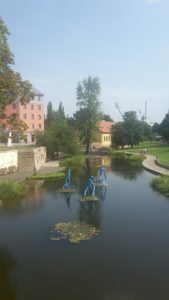 My work with Čojč Theaternetzwerk Böhmen Bayern forms a case study within the project work package led by Heriot-Watt and the Latvian Academy of Culture focusing on cultural forms and expressions of identity in Europe (PI: Prof Ullrich Kockel). Curious about Čojč and Like/Hate? Meet the participants and watch the project vlogs here: https://www.like-hate.com. Two of seven performances in Passau and Pilsen are also available as a livestream on the Čojč Land Network Facebook page https://www.facebook.com/cojcface/.